You know all those biotech shills who still claim that there is no ‘science’ behind anti-GM claims? What if millions of members (PDF download) of the global medical community disagreed? There is no consensus on the safety of GMOs, though numerous organizations believe that they should be labeled at the very least. Without a label, there is no traceability, no accountability, and no liability. Likely the way that Monsanto, Dow, Syngenta and others want it. But this is certainly not something we have to accept. GMO labeling is, in fact, doctor-recommended. And the list goes on – it is replete with doctors, nurses, public health officials, and even geneticists. Yet Monsanto, Dow, Syngenta, Bayer, etc want us to believe there is no science that proves GM foods are questionable? All those doctors, nurses, and health workers must be confused. We aren’t mistaken, though. GM foods need to be labeled so that they can be avoided by those who don’t want to eat potentially carcinogenic, spontaneous abortion, organ-damaging crops. 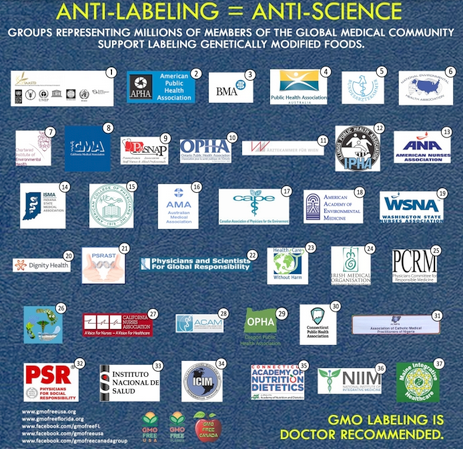 Labeling is the wrong fight. GMOs need to be banned outright, no exceptions at all, ever. And those responsible (those from biotech and the government agencies that allow it) for unleashing that WMD on the world, needs to be on trial for crimes against humanity. I found out an earlier, Chipotle Restaurant is not 100% non-GMO yet, because it still getting meat products that is still has GMO feed in them. I bet the list for bans would be a lot larger! Thank you Christina for putting together this list. Where are you at on this one GMO ROBERTS? Um, wait, I mean MR. MONSANTO ROBERTS. So are these organizations just confused, MR. MONSANTO ROBERTS like you claim for the rest of us NON-GMO’ers? And Skeptologist, does having 26 legitimate health organizations account as an anecdote or are the denial spectacles still blocking you? I think he has nothing to say for once. Sorry to disappoint you Mikey, I mean John boy, but I’ve had to much work to do helping my customers get their gmos planted for yet another bumper crop. What about the article Mr. Monsanto Roberts. What about those 26 legitimate health organizations? So all them doctors on these health organizations wrong? Where are you at on the issues here Mr. Monsanto Roberts. I am still waiting to meet this Johnny. Are you lying to me, Mr. Monsanto Roberts about this Johnny. Oh wait, lying for you is nothing past your tactics. Please please however enlighten us with your wisdom on this article and all them doctors and organizations.